Deirdre Nic Mhathúna received her BA in Irish and Ghearmáinis at Trinity College, Dublin. She graduated with a doctorate from Cork University College. 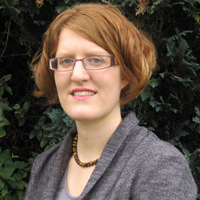 The specific areas of her research are seventeenth century poetry, reading manuscripts and edited texts from Irish antiquity. She has specialized in the poetry of Pierce Feiritéar, and has prepared editions of his work in print. She has great interest in the Dingle Gaeltacht and in oral and written traditions of the area, especially in the life stories and writings of Thomas Collins Chriomhthain. Bhain Deirdre Nic Mhathúna amach céim B.A. sa Ghaeilge agus sa Ghearmáinis i gColáiste na Tríonóide, Baile Átha Cliath. Bhain sí céim dochtúireachta amach i gColáiste na hOllscoile, Corcaigh. Is iad na sainréimsí taighde atá aici ná filíocht na seachtú haoise déag, léamh lámhscríbhinní agus eagarthóireacht ar théacsanna iarchlasaiceacha. Tá spéis ar leith aici i bhfilíocht Phiarais Feiritéar agus tá eagrán dá shaothar á ullmhú don chló aici. Tá spéis mhór aici i nGaeltacht Chorca Dhuibhne agus i dtraidisiúin bhéil agus scríofa an cheantair, go háirithe sna scéalta beatha agus i scríbhinní Thomáis Uí Chriomhthain.